When it comes time for voting on the best toy company of the year, Toybiz will be the ones to beat. Between the Marvel Legends line and the Lord of the Rings line, Toybiz has developed a huge following in the collector community. It's not undeserved either. While not every figure produced is perfect, the overall quality and design of both lines is well above average. Twenty years from now, these will be the lines everyone is looking for. 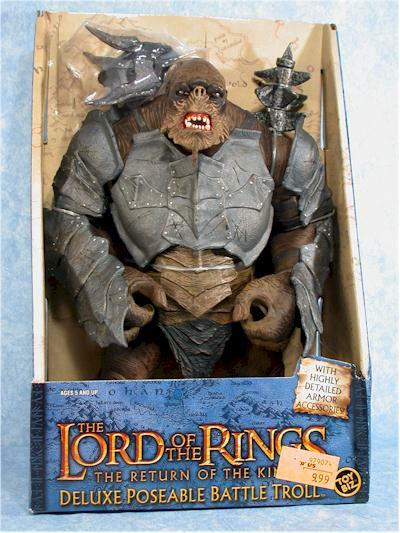 Toybiz has hit the LOTR license with a variety of scales and styles. One of these is the 10" rotocast scale, which has had a number of cool figures already. 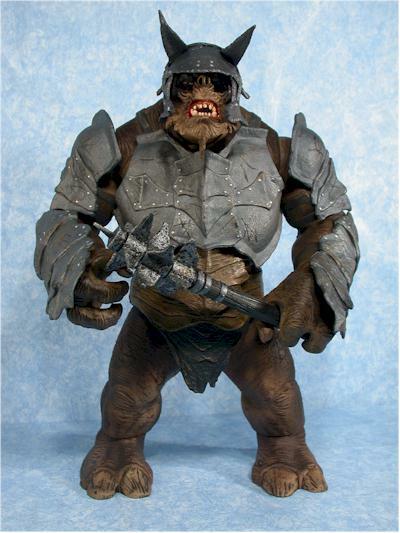 The latest wave includes the Battle Troll, fully armored and ready to crush some hobbits. The price point on the rotocast line is $10, a real bargain in today's market. 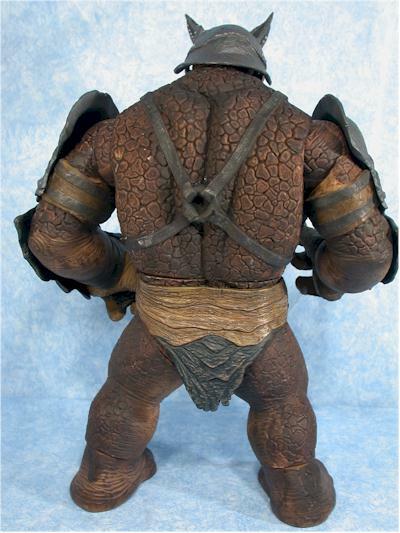 While Toybiz has already released two versions of the troll before - cave and battle - that version had issues with the soft rubber face tearing easily. This version is much sturdier, and half the price. All the rotocast figures come in the open faced, cheap boxes. It helps keep the cost down overall though, so I can only complain so much. There's nothing here to tear, but I suspect we'll see lots of clubs stolen. The Battle Troll has a different looking head than the Cave Troll, but that's not surprising - you don't think they all look exactly alike, do you? The detail work on the head is great, with plenty of texture and a truly menacing expression. This guy has better dental hygiene than his underground cousin, and those sharp, pointy teeth look like they could do some serious damage. 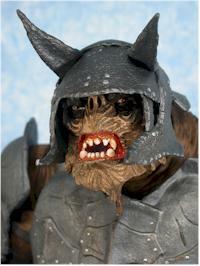 The armor is also very nicely done, with a realistic texture and plennty of detail work. Amazingly enough, it doesn't get in the way of the articulation. Perhaps most critical is the scale of this figure with the 6" line - it's extremely good. Sure, he's a tad small, but so was the previous version, and this one is half the cost. He'll look extremely good displayed with the rest of the line, and yet not take up the entire shelf. The paint ops are solid, with a variety of colors, and nice detail work on the eyes, mouth and teeth. They've even gone with the slightly more expensive but oh so cool use of multiple finishes. 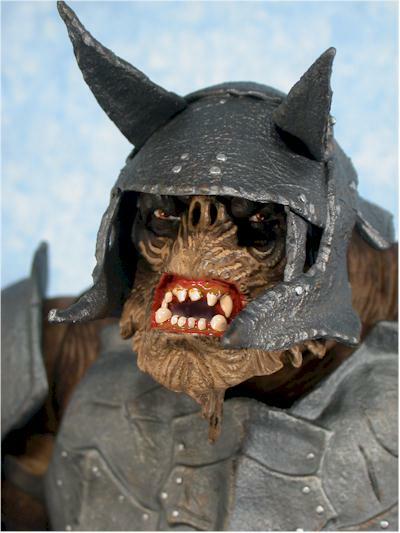 Notice how the gums are shinier than the face, and the finish on the armor makes it appear to be a dull metal. The body uses a general wash to bring out the detail and give him that rough, dirty look. While they could have cheaped out in some places, like not painting the rivets on the armor, they didn't. Toybiz continues to impress with their willingness to go the extra mile, satisfying both the kids AND collectors. Mr. Troll won't be giving Mary Lou Retton a run for her life any time soon, but he's better articulated than you might expect. There's neck, ball jointed shoulders, cut wrists, waist, hips and ankles. That mans you can get him to stand with the arms in a variety of positions, and he can be appropriately terrifying when displayed with the regular 6" line. There are two accessories - his battle helmet and his spiked club. Both are made from a soft plastic, to avoid taking out little Jimmy's eye, but still hold their shape fine. The sculpt and paint ops are solid, and the helmet fits perfectly. 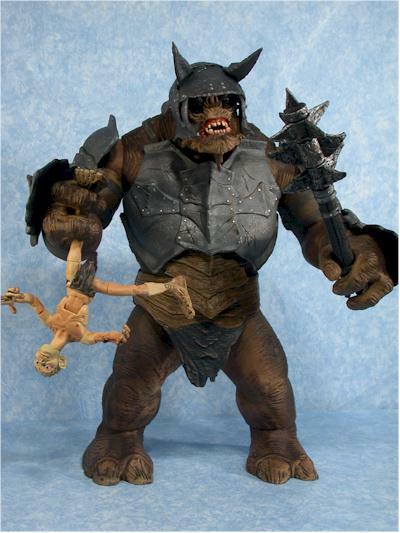 This figure is a ton of fun, perfect for kids looking for a troll to battle the rest of their figures. He's much sturdier than the previous version, has nothing to break off, and is articulated just enough for the kid crowd. 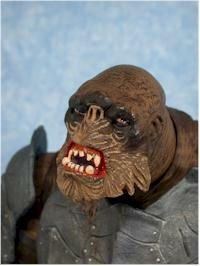 At ten bucks, he runs the same price as the other Toybiz rotocast stuff. However, that's a fantastic value, much better than most figures on the market today. Considering that the 6" figures run $6 - $8, depending on the retailer, it's very impressive that they can pull this off at just a couple bucks more. There's a reason Toybiz is so popular right now - they're at the top of their game. I don't collect the regular 6" LOTR line, and I can guarantee that 20 years from now I'm going to regret it. Don't make the same mistake, especially since so many of the figures are available on the small cards for just six bucks these days. 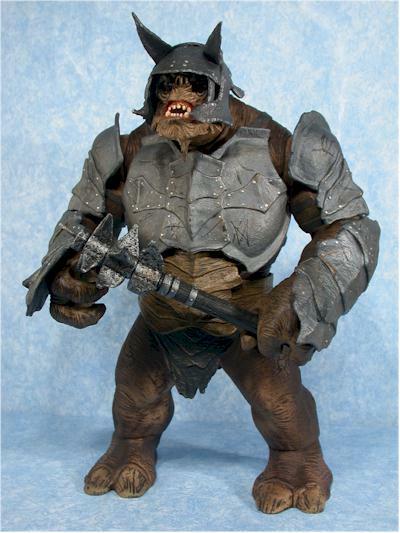 I picked this guy up at Toys R Us, where I see the majority of the 10" rotocast Lord of the Rings figures. There is also the new Eomer in this assortment.